WASHINGTON (CNN) -- President Obama has started arming for the possibility of a major Supreme Court nomination battle, pulling a longtime Democratic power player into the White House to help run the confirmation process, senior administration officials told CNN. 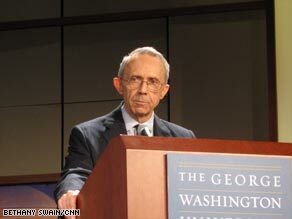 Justice David Souter is retiring and President Obama is expected to choose his replacement soon. Stephanie Cutter is leaving the Treasury Department, where she has served as one of Secretary Timothy Geithner's most senior advisers during the financial crisis, to be the point person for mobilizing public support for Obama's pick to replace retiring Justice David Souter, three senior administration officials said. Administration officials say Obama is likely to name Souter's replacement in late May or early June, before the president leaves for Egypt to deliver a speech to the Muslim world. Regardless of whom he picks, liberal and conservative activists are already bracing for an epic battle over the future of the high court. Cutter will reprise the key behind-the-scenes role that Republican operative Steve Schmidt played for the Bush administration on the successful nominations of Chief Justice John Roberts and Justice Samuel Alito. Schmidt later became the chief strategist for Sen. John McCain's presidential bid. After cutting his teeth on the successful Bush 2004 re-election effort, Schmidt was pivotal in plotting strategy to round up Senate votes for the Roberts and Alito nominations during President George W. Bush's second term. Schmidt also employed his rapid response skills from the 2004 campaign to aggressively push back against allegations lodged against Roberts and Alito in the media. Cutter, a lawyer, helped Senate Democrats plot strategy on the Roberts and Alito nominations. She also spent several years as a top aide and adviser to Sen. Edward Kennedy, D-Massachusetts. Kennedy is a key member of the Senate Judiciary Committee, which will review Obama's nominee. Like Schmidt, Cutter also brings sharp elbows, dating back to her time as a senior adviser to Sen. John Kerry, D-Massachusetts, during his 2004 presidential bid. Her new assignment suggests that while the president has a comfortable majority in the Senate, White House officials are preparing for a bruising fight just in case. While various officials downplayed chatter about tension between Cutter and Geithner, it is not clear whether she will return to Treasury as counselor when her White House assignment is over. In fact, before Cutter accepted the Supreme Court role, several administration officials told CNN there was one plan for her to leave Treasury to become assistant secretary for public affairs at the Pentagon. Administration officials stress there are several scenarios for Cutter after the Supreme Court nomination process is over, including a possible return to Treasury. In the meantime, Jake Siewert, former press secretary in the Clinton White House, is being pulled in to serve as a counselor at Treasury, according to the officials.